It takes a very skilled author took keep a book series going over 8 books (soon to be 9, when Ghost Town is released on October 24, 2010) and still keep readers thoroughly satisfied and eager for more. Kiss of Death most definitely meets expectations and keeps those pages turning. Seeing as this is the 8th book, characterization is basically complete. None of the four main protagonists change much over the course of the story, as they had in previous books. Instead, we have side characters really blossoming and showing their true colors. Among them were Oliver, of whom we see a more compassionate and almost human side. But my favorite character that got more emphasis in this book was Eve’s brother, Jason. He has come to the forefront, and, just like in the previous books, I still couldn’t decide whether I liked him or not, or whether he could be trusted. But that’s half of the fun, isn’t it? The entire time I am reading any one of Caine’s books, I always have the feeling that within all this mayhem and chaos, Caine is setting us up, biding her time until the time comes for the final, massive HURRAH. Something big is going down in Morganville, and I for one can’t wait to find out. My only complaint is that the ending seemed to wrap up to cleanly and quickly for what was going on. I would have liked a little more conflict. I give this novel 4 out of 5 stars. I love the Morganville Vampires! 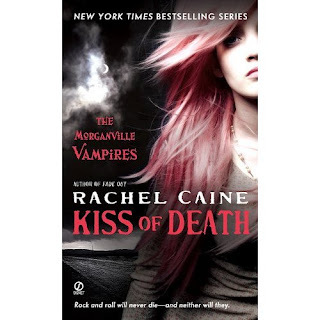 Rachel Caine writes a excellent series that keeps going and your reveiw was fabulous. I also love Weather Wardens (also by Rachel Caine). Perhaps you could review these sometime?